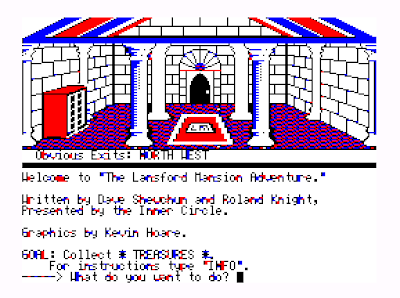 The Scott Adams influence was visible in many 1980s adventures including Lansford Mansion -- the windowed text display, the two-word parser and the SCORE mechanism are very similar, and as in several of Adams' adventures, our goal is simply to Collect * TREASURES *. The parser isn't quite as solid as its inspiration's, though -- extra spaces tend to confuse it, and it has a bad habit of confirming with an OK message before actually processing the player's command, leading to OK / Sorry, you can't! types of responses. Interestingly, the game supports the Radio Shack speech/sound pack, augmenting the CoCo's limited audio capabilities, but I wasn't able to play the game with that feature enabled. 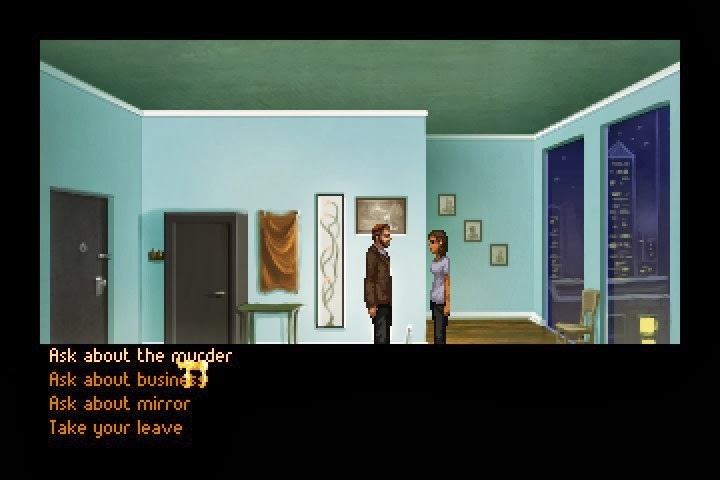 As with many graphically-augmented text adventures, the visuals here are not really necessary, and in fact they get in the way more often than not, as they overlay the display window listing available items and exits and the artist makes no attempt to depict some important details of each room. Fortunately, the illustrations can be turned on and off with a function key (the PC Alt key when using Joseph Forgione's Virtual Color Computer emulator) so the player doesn't have to make a permanent choice between pretty pictures and concrete information. 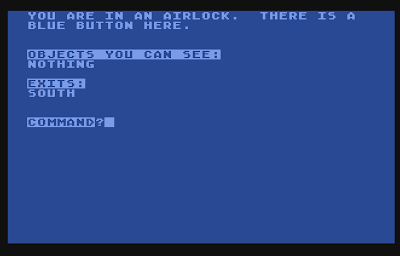 The illustrations are half-screen bitmap images residing on a second diskette; the executable code and all text loads from the first, so no disk swapping is necessary after starting up. Like most CoCo games that use artifacted colors, we have to reset the machine until the check screen is blue in order to see the artist's intended palette. We begin in the entry hall of the Lansford Mansion, with lots of items in the first room - an axe, a hose, and some boots, though the first two items are locked in a glass cabinet. We can't ENTER the DOORWAY to the north, only GO, but a Guard throws us out if we try to get past the entry hall. We can GO DOORWAY from the starting location to explore the outside of the mansion. A Pole in a garden area outside the mansion to the east of the entrance is too smooth to climb, but we note that the garden has very moist soil in it. There's a sports car in the parking lot west of the entrance, and we can apparently unlock the door somehow, as EXAMINE CAR suggests that One window is open a tiny bit. There's no DIG verb in this game, which is unusual, and it seems we have to WEAR things explicitly. We can find some Wire cutters in an open field east of the southeast parking lot, but there's no CUT or USE verb -- it seems some of the puzzles just require possession of the appropriate equipment to OPEN or GET things. The SAVE GAME command writes to the image disk, which is convenient, and the save feature has a generous ten slots available, numbered 0-9. We can SIT DESK in rooms with no desk in them, though nothing really happens as a result. And INVENTORY doesn't work, only I. North of the starting location is an entry hall with an Open doorway, a Table, and a Vase full of flowers. A guard sends us back if we try to go through the doorway -- "No visitors in this part of the mansion." We can remove the flowers from the vase with TAKE FLOWERS, but we can't PLANT FLOWERS in the garden. We can EMPTY VASE to create a Puddle of water, and TAKE WATER to put it back in the vase; left alone, the puddle eventually evaporates. Aha! We can SHAKE FLOWERS a few times to yield a couple of seeds, and PLANT SEED in the garden, though nothing happens immediately as a result. So we've explored the available map and done some experimentation, and I'm back where I got stuck on my previous attempt. We can't use the wire cutters to disable any alarms in the entry hall or the library, nor can we climb the plant in the garden (after it appears) without some structural reinforcement, so those ideas proved fruitless. I needed the walkthrough to learn that we can RIP PAGE from the book in the library, then YELL FIRE so that the guard leaves (and liberates the fire axe from the case in the entry hall) so that we can OPEN CASE and replace the paper we want to examine more closely with a coded page from the book. Once we have it in hand, the paper, which previously seemed to have nothing interesting written on it, in fact says: "I hearby [sic] give the holder of this paper permision [sic] to enter any room in my mansion, R. Lansford." Apparently the mansion's owner had some spelling difficulties, and I never did find a way to decode the book or its torn-out page. But now we can explore the mansion much more freely, and we can get the hose from the glass cabinet in the entry hall. North of the room with the table is another hallway, with a Large pipe organ and exits going in many directions. PLAY ORGAN yields, "Yuk! Sounds terrible! ", so that's probably a puzzle we'll need to return to later. East of the organ room is an office with a chair and desk. We can SIT CHAIR to find a typewriter bolted to the desk (and completely invisible if we EXAMINE DESK without sitting down.) We can TYPE, though at this point there doesn't seem to be any reason to, so we'll just GET UP. West of the round room is a metal room with a TV Monitor, TV Camera and Metal door. The monitor reads, "MAINTENANCE CARD REQUIRED FOR ADMITANCE [sic]." Another, similar room to the north requires a SECURITY CARD for admitance admittance. Further up the staircase, we can access a storage room, a small room with a small button, and another small room with a Strange piece of machinery featuring a glass plate attached to the top of the machine; in the illustration, it resembles a photocopier. The storage room features a metal box pointing at a chair; we can SIT CHAIR to discover a microphone, a large slot, and a button, none of which has a clear purpose or function at the moment. The third story (this staircase goes and goes) contains a room with a glass floor, a very deep pit, and a very hot room containing a Piece of very hot metal that we can't cool down by EMPTYing the VASE. Even stranger, below the hot room is a dungeon like room where a Weak looking man cries, "Food! Food! I must have food!" Four floors up, at last, is a single, glass-domed room at the top of the mansion -- it's the SCORE room, with a "Drop treasures here then score" sign in the Scott Adams tradition. We've explored the accessible map, so it's time to do some puzzle solving. We can WEAR the BOOTS from the entry hall. We can CLIMB the PLANT that's now grown where we planted a seed -- except the "Plant bends over and you're thrown to the ground, breaking every bone in your body!" and it's time to restore again. There's now a hole in the cabinet window in the entry hall -- our false fire alarm earlier inspired the guard to break the glass and remove the axe, apparently, so now we can GET HOSE and TIE PLANT -- To what? -- TO POLE -- With what? -- WITH HOSE, allowing us to CLIMB PLANT successfully and enter a large bedroom. There's a coat here, and closer examination reveals a Coat hanger. We can't seem to unlock the room's locked interior door, so our only option is to go back out the window. With the coat hanger in hand, we can't BEND or USE or INSERT HANGER or UNLOCK CAR... but we can UNLOCK DOOR -- How? -- WITH HANGER, and then open and GO DOOR (GO CAR fortunately yields Try: "GO DOOR"). We can't, however, START CAR, as it appears to be out of gas, which is probably why another car is available in the other parking lot. With the hose (retrieved from its plant-securing position) and the emptied vase, we can SIPHON GAS. Then... hmmm... INSERT GAS, FILL CAR, FUEL CAR, GAS CAR... nothing seems to be working. But we can't DROP GAS... interesting... ah, we have to PUT GAS -- Where? -- IN CAR. It seems PUT takes the place of INSERT in this parser's construction. And now -- nope, we still can't start the car, probably because we don't have the keys. What now? We can't OPEN GLOVEBOX, though the noun is recognized, unlike WHEEL or SEAT. We can EXAMINE DASHBOARD to find a couple of loose wires, and CONNECT WIRES, allowing us to fire up the engine at last. There's a road going north from here, and while we can't GO NORTH sitting in the car we can DRIVE NORTH. Unfortunately, a few locations up the road, You get pulled over for speeding and when the cop finds out the sports car is stolen he arrests you! We're now in a jail cell, with a Locked door, naturally. We can't PICK LOCK (the verb isn't recognized) or CUT LOCK with the wire cutters; UNLOCK DOOR yields Sorry, you have no key that fits. So we must have missed something prior to this point, and it's time to QUIT and restore again. I needed a hint at this point -- while EXAMINE BED doesn't suggest there are sheets present with which we can interact, EXAMINE SHEETS is recognized (though still, You see nothing special.) We have to GO BED to see a Nail file as well as the Sheets, and EXAMINE SHEETS to discover they are lined with gold, making * SHEETS * the first treasure we've found. Dropping them in the domed-roof room yields a SCORE of 10, on a scale of 0 to 100, so it seems we'll need to round up ten treasures. Will the nail file help us escape from jail? Well, it might, as when we get arrested for speeding, the police confiscate the file. Trying again, I learn that we can PUT FILE / IN BOOTS, and thanks to shocking police incompetence, keep it long enough to FILE LOCK and escape the cell. We can even examine the unattended police desk, open a drawer and discover a * GOLDEN GUN *, a * GOLD POCKET WATCH * and some * MONEY *. If we GIVE BOX to the starving man (we have no way to warn him about the possible lead contamination) he eats it and runs off, leaving us with a * GOLD BAND * in return. So we're back up to 4 treasures. And with the metal glove on, we can pick up the piece of hot metal, if we come up with any reason to do so. We can try to JUMP in the pit room, but that's fatal. What else? There are those security doors on the first floor, and some apparatus reminiscent of Adams' Impossible Mission adventure that suggest we need to create our own security cards. My earlier attempt produced a Blank picture; we can't PUT this PICTURE in the typewriter, or in the slot of the chair with the metal box, but we can put it on the glass plate of the strange machine. Putting it there, and pushing the small button in the next room... dang! It causes the machine to explode into a pile of smoking rubble, leaving the blank picture intact. This is probably not what we wanted to happen. Dropping the hot metal on the room with the glass floor causes the floor to heat up... but that doesn't seem to have any real effect? Ahhhhh... walkthrough time again! I was supposed to get the water back after emptying the vase to siphon the gas, and this has to be done quickly as there is just enough time to put the gas in the car and return to retrieve the water. Mine evaporated long, long ago. Soooo... it's back to square one for a retracing of my steps up to this point. Now we can use the hot metal to heat up the glass floor, with a chaser of cold vase water to shatter the glass, creating a Hole in floor leading to a greenhouse. A sad looking gardener is here, but he's not distraught over being sealed away in an otherwise exitless greenhouse, perhaps to accompany R. Lansford in the afterlife; his primary concern is that he needs one seed, which is why the flowers yielded two earlier. We GIVE SEED and gain the gardener's * RARE COINS * collection in exchange. There's also a backpack here, though it can't be opened, shaken or otherwise examined. With the coins, we're up to 50%! Halfway done! Now, about that camera... I thought maybe we could aim the camera up through the glass floor, but those rooms aren't actually adjacent. I needed to reference the walkthrough again to understand that the camera is on a timer -- so after we push the button, we have to run back to the room with the mirror, open the curtains, and SHOW repeatedly for five turns (I tried to figure this mechanism out in more detail, but it seems to be very particular -- fewer turns doesn't seem to do the trick, and I don't think I would have guessed that SHOW was the magic verb.) Now we have a picture of ourselves (I am assuming, examination doesn't confirm this) that we can use to fake our way past the security doors. This involves putting the picture in the typewriter (unlike the blank picture, the "real" picture inserts just fine) and TYPEing SECURITY (I first tried to TYPE MAINTENANCE, figuring I might be able to crack the lower level of security more easily to access the first camera-guarded room, but when we try to read the typed message afterward the game replies, "Sorry, you can't make it out"; the only successfully legible text is SECURITY, and fortunately we can type over any illegible text we've already tried.) We can now SHOW PICTURE at the northern security door, and it allows us to quickly dash into another metal room with a * SMALL RUBY *, some Sheets of cloth, and a small button used for exiting. Now... can we augment this security picture to make it valid for maintenance also? I tried putting it on the strange machine, going to the microphone system, SAYing MAINTENANCE, and pushing that button; nothing changed in the other room. Pushing the button in the room closest to the machine destroys the equipment again, but we end up with an enlarged picture. This Large picture can be placed into the microphone chair's slot, and then after we say the magic word and push the button, we are returned an updated picture with MAINTENANCE typed on it (the picture is now too large to fit into the typewriter, so this is the only way to do this.) It seems odd that Mr. Lansford has more complicated security procedures around gaining maintenance access than an official security ID, but we've seen stranger systems in adventure games. Now we can enter the maintenance area, obtaining a * SAPPHIRE RING * and some pieces of rope. 70% now, and we're starting to run out of puzzles. What about the piranha? With the metal glove on, we can GET PIRANHA PIRHANA and return it to its tank -- though rather than a grateful rescued piranha, we end up with a tank otherwise full of well-fed and satisfied fish, and now we can GET the mysterious BOX out of the tank. What now? There's that fatal pit left over... and we have some sheets of cloth, several pieces of rope, and a backpack, raising the suspicion that we can... MAKE PARACHUTE? Yep! We have to pick our Make-shift parachute up after assembling it, but we don't have to (and can't) WEAR it. We just JUMP at the edge of the pit, and now we are floating down; we have only one chance to snag a Metronome and a * DIAMOND * conveniently placed on passing ledges, before our parachute gets ripped to shreds and we land back in the organ room. Simply STARTing the METRONOME and PLAYing the ORGAN again doesn't help the results at all -- odd? Ah (thanks, walkthrough!) 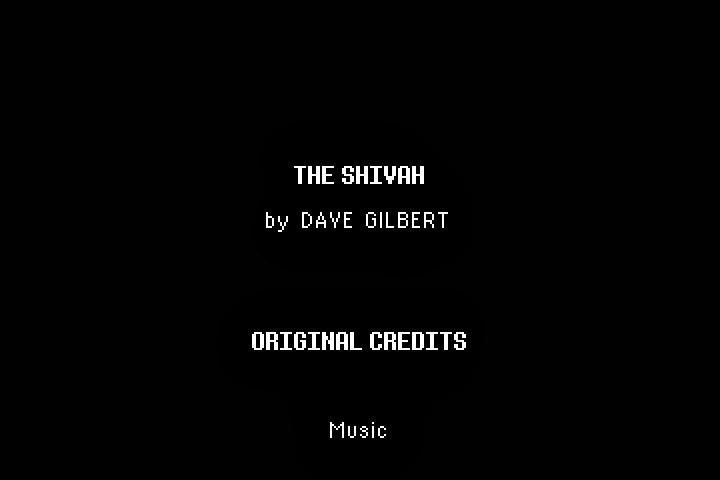 -- we have to DROP METRONOME after starting it, and now that we got rhythm, the Music causes a secret panel to open! revealing a new passage containing a * SOLID GOLD BAR *. We have all the treasures now, and taking these last few to the score room should yield the expected victory... except... after we type SCORE and confirm our 100 points, the treasures do something very odd, magically melding together and becoming something altogether different. Now there's a Half of a large electrum star in the room, and we can't go D to the rest of the mansion anymore. We can't GO STAR or JUMP to get sucked into it, but we can GET STAR -- and thus, we are presented with a password for The Lansford Mansion Adventure Part II -- which unfortunately never saw the light of day as far as I can discover. As it's been a good 25 years we've been waiting now, I'm just going to call that second game a forfeit and declare unmitigated victory! The Lansford Mansion Adventure is not a perfect game -- its challenges arise too often from design assumptions that the reader may not share, or maybe the hints were just too subtle for me to pick up on. But I enjoyed the challenge, and the obvious Scott Adams homages, once I had a solution handy to help me through the frustrating bits. I wish the sequel had materialized; the disk image contains a LANSFORD/BIN and a LANSPRT2/BIN file, but these seem to be two binary sections of this one adventure. Onward we go! 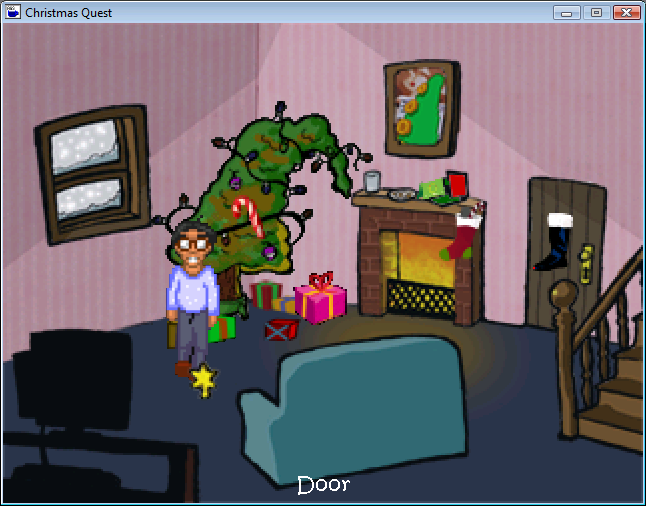 This week, as the holidays are upon us, we're going to tackle Christmas Quest, a point-and-click animated adventure game created by the staff at www.adventuregamers.com as a short, free, seasonal treat for Christmas 2005. It was written by Jack Allin and Emily Morganti, with programming by Berian Williams, music by Robert Lacey, and art and animation by a six-person team. 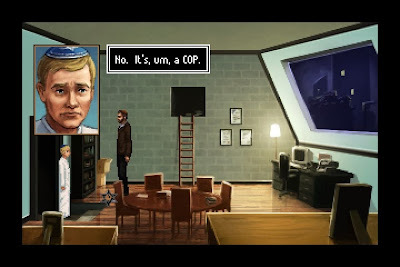 The game was created using Chris Jones' invaluable Adventure Game Studio, a creation tool and runtime engine without which many fine contemporary adventure games would not exist. This game is meant to be a quick, entertaining play, but it looks and sounds very professional, something that would not have been possible on a limited budget without AGS to handle all the technical details. And Mr. Jones has always made his tool available free -- a fine example of a generous spirit all year 'round. 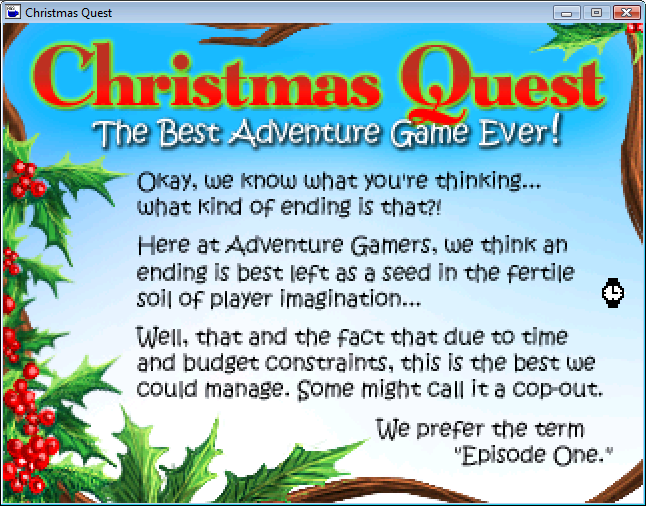 After we start a new game, a few screens of text (with voiced narration by Doug Tabacco) set up the plot -- we're certain Santa Claus has delivered the Best Adventure Game Ever, and (compulsive sort that we are) we must solve some puzzles to restore the perfect holiday setting before we can sit down and indulge in all its Besty Everness. We fade in on our living room on Christmas morning, with a wilting, unlit Christmas tree, a locked closet door with a keyhole, a star that has fallen off the tree, a fireplace, and a bulky, unattractive turquoise couch. There's also a staircase leading upstairs, but we can't make use of it -- "kinda defeats the purpose of coming down, doesn't it?" And the power is out, so the tree lights and our trusty gaming computer are both out of commission. 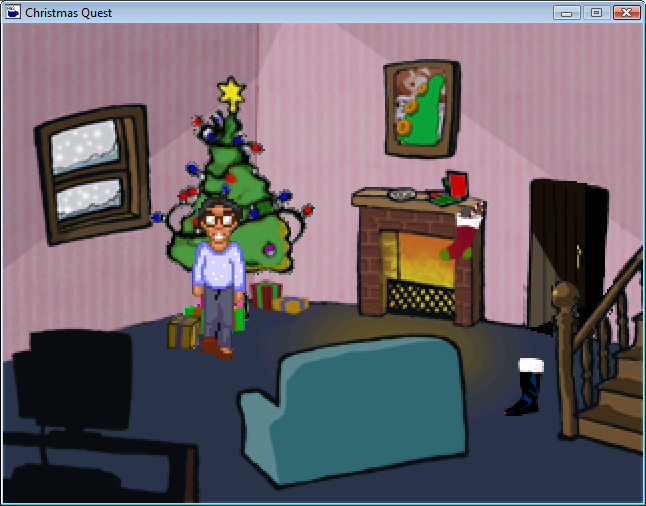 Most of the items onscreen can be interacted with, though many of the responses are just for chuckles; for example, concerning the lit fireplace, "I really should have put this out last night. Santa can't have been pleased." The main character isn't voiced, but the writing is light-hearted and gently funny, with in-jokes tailored to people like me (us, I whisper conspiratorially to long-time GA40 readers.) Just to set the tone, some of the Christmas cards on the mantle are from Sierra's Ken and Roberta Williams, Steve Purcell/Lucasarts/Telltale Games' Sam & Max, Sierra's Gabriel Knight and friends, and there's a portrait of Lucasarts' Green Tentacle on the wall. Examining the presents under the tree yields a bulky, pink, unopened present, a multi-purpose Ulti-Pan, and a refusal to open a present that isn't for our hero ("What kind of a take everything that isn't nailed down klepto would take someone else's present?") We can pick up the fallen star, but can't put it back on the tree just yet as it will just fall off the wilted treetop again. We can take the empty glass of Santa milk milk for Santa, which the text reminds us is always useful in adventure games, just like a rope. We can also acquire a candy cane ("not drawn to scale") from the tree. We can open the window to the chilly, snowy outside world -- I was hoping we could catch enough falling snow in the pan or the glass to water the tree, but that didn't work out until I realized I was clicking on the Window and not the Snow. Of course, we have to melt our glass of snow in the fireplace, and now we can water the tree, miraculously restoring its turgor pressure in the blink of an eye. 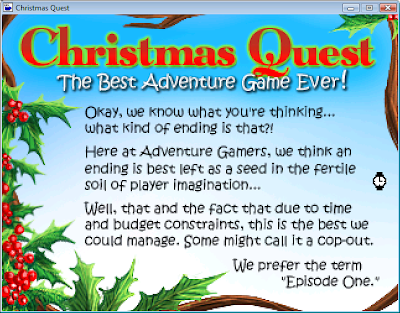 Christmas Quest was actually a little more challenging than I expected -- the contained space and limited number of items notwithstanding, I had to do a little more trial-and-error experimentation than I thought I would. But it's a pleasant, straightforward, and entertaining little game, and the perfect title to post about on Christmas Eve. I'll likely be coming back to this series in years to come. And thank you to everyone who visits and reads the Gaming After 40 blog; your comments are some of my favorite gifts of all. Happy Holidays, everyone! 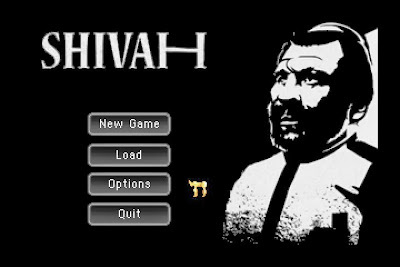 What I really like about The Shivah is that, while the plot is a fairly straightforward detective story, it's set in a world that few games have attempted to explore. Our protagonist Rabbi Russell Stone is the recipient of an unexpected gift from a former member of his synagogue, a man who died recently under suspicious circumstances; moreover, the deceased and his Indian wife-to-be parted company with Rabbi Stone under duress eight years ago, after he refused to officiate at their interfaith wedding. Stone's attempts to find out what happened to his unexpected benefactor lead him into danger and intrigue, but he is always first and foremost a Rabbi -- he has his doubts, but he also stands by his religious convictions. The story begins at a poorly attended Shabbat service, where we meet young cantor Josh and learn that our protagonist, Rabbi Russell Stone, is struggling with faith -- in his dwindling and unenthusiastic membership, and in the bigger picture as well. He cancels the service and retires to his office, where an unexpected visitor gets the plot moving. From a police detective, we learn that a man named Jack Lauder, recently murdered, has bequeathed ten thousand dollars to B'nai Ben-Zion, which surprises our hero as he and Lauder parted on poor terms some eight years earlier. 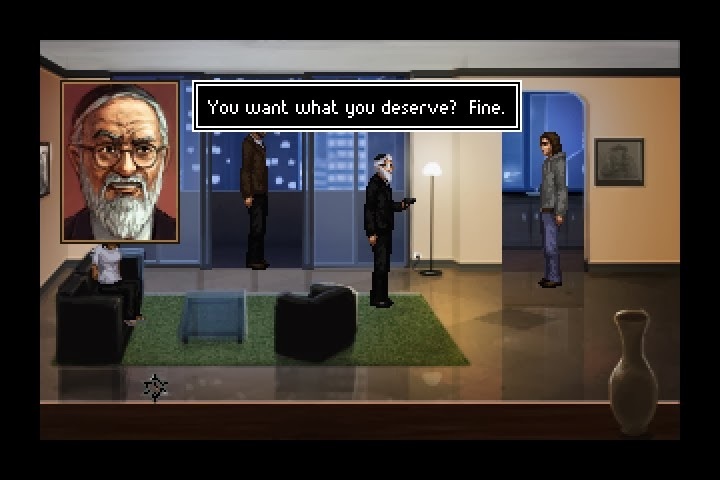 The cash will definitely come in handy, but something doesn't sit right with the Rabbi, and he begins to think he should look into the situation a bit more closely. We can explore the Rabbi's office, noting some unpaid bills and artifacts of the Rabbi's past, but we can't really get anywhere until we hack into our own computer (an older machine, set up by the cantor and previously unexplored.) I tried various email ID possibilities, before guessing the right one, rstone; later, I looked at the Rabbi's business card and found it there, so it's not really necessary to guess. We can use the CLUE button and the built-in brief Yiddish glossary to guess the Rabbi's password. Reading through his email gives us some information about his temple's current poor fortunes. We can also use the computer's search function to obtain an address for Lauder's apartment, adding a destination to the map of Manhattan. Rajshree Lauder (nee Sharma) isn't too pleased to see the Rabbi, once she knows who he is, but she accepts his interest in investigating her husband's death and provides some information about the family business, a fashion design company called Sharming Industries. The office is almost completely empty, but reading the company ledger and email establishes a couple of things -- one, the Lauders were good partners and loved each other, and two, the company was having problems with one of its investors, a Joe DeMarco, as noted by the company's accountant, Ethan G. -- Ethan Goldberg, of Goldberg & Weiselbaum -- and quite a few personal checks written to Mr. DeMarco. The Shivah features a notebook clue-combination mechanic that's also used in at least one of the Blackwell games, where we can drag-and-drop concepts onto each other to draw formal conclusions -- even if we've figured out the relationships on our own, we need to establish them in-game to open up conversation topics and locations. There aren't very many topics to combine, and most of the "puzzles" here have to do with figuring out who Ethan is and setting up some questions about whether this Joe DeMarco was Jewish, as he apparently did quite a bit of business via networking at Beth Tikvah, where Lauder and Ethan also attended services. Visiting Beth Tikveh proves interesting -- the temple is clearly financially well provided for, and Rabbi Amos Zelig seems not to know his congregation very well. He claims little recollection or acquaintance with Lauder, Goldberg or DeMarco. Searching for news on the characters involved on Rabbi Stone's computer discovers something unsettling -- Ethan Goldberg was himself killed recently outside a bar known as Paddy O'Hare's. 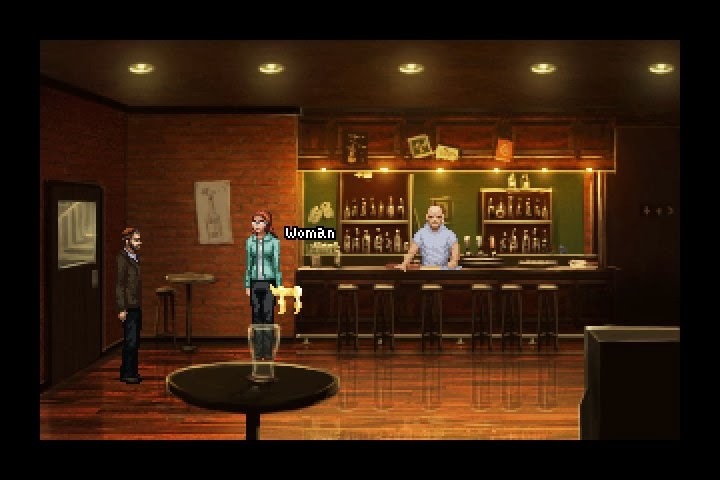 Visiting the bar provides a small treat for Blackwell series fans, as Rosangela Blackwell is here with her spirit guide Joey; she's too distracted to speak with us, and Stone sees her as many other people likely do, as a poor woman talking to herself. Rajshree Lauder knows Joe DeMarco was an investor, but knows nothing about the tension between her husband and the investor. Revisiting Beth Tikvah with some more pointed questions about the relationship between the murder victims and the synagogue ultimately leads to Rabbi Zelig giving Rabbi Stone the boot, leaving him with his business card and promising availability for questions via email, which we don't really expect him to provide. A return trip to the bar encounters the mysterious Joe DeMarco himself, a surly, seedy-looking individual who also admits to no knowledge of Lauder or Goldberg, and says the checks written out by Sharming must have been to a different person with the same name. I got stuck here for a while -- DeMarco doesn't seem vulnerable to any of the question topics we can raise, Beth Tikvah is off the map, Rajshree has nothing new to add, and the Rabbi hasn't gotten any new email. I tried some search topics (including Beth Tikvah and Rabbi Zelig) without learning much of investigative value, and finally had to consult a walkthrough that suggested hacking into Rabbi Zelig's email. We have his email address from his business card, and his password clue references his beloved dog, Dodger, mentioned in Zelig's online bio; reading his email suggests that DeMarco has been carrying out "hits" on Lauder and Goldberg -- very likely on Rabbi Zelig's orders. The game's climax takes place in Zelig's elegantly appointed, expensive apartment on the Upper East Side, and it took me quite a few attempts at this section to reach the most positive ending. Rajshree Lauder has been kidnapped (we can see her disturbed apartment if we visit before coming here) and Rabbi Zelig has no intention of letting Rabbi Stone disrupt his lucrative religious community. Zelig is not a man of direct action; he orders Stone to jump off the balcony, threatening Rajshree if the Rabbi does not do as he commands. It seems sensible to try to grab Zelig's gun, but while he misses with the first few wild shots as we approach him, he connects with the third bullet and the game is over. I thought perhaps we could get him to run out of bullets before killing us, but that didn't work out either -- refusing to follow his orders for too long gets Rajshree killed, which uses up the third bullet at considerable moral expense, and we still get killed out on the balcony anyway, as Zelig shoots us once in each arm, and once in the head. The right thing to do (assuming we have not killed DeMarco) is to feign agreement with Zelig's command and head out to the balcony -- before we get through the sliding glass door, DeMarco shows up to demand his money for killing Lauder and Goldberg. But Zelig doesn't take kindly to demands, and he shoots DeMarco, sparing Rajshree in his haste to remove Stone from the picture. On the balcony, we have to get close enough to Zelig to grab his gun, distracting him long enough to do so. This involves making two attempts to grab the gun head-on, resulting in bullet wounds to both of Stone's arms but allowing us to get closer to the target. Then we have to climb over the edge of the balcony, hesitating to jump, claiming we are admiring the view (something Zelig is very proud of.) When Zelig looks out at the view himself, we can grab the gun -- with Stone's injuries, he's not able to hold onto the weapon, but at least it's out of the picture. Rabbi Zelig is a bit of a fighter himself, and Stone is not at his best. We can keep Zelig engaged in conversation, and I was able to get a few punches in at times, but I kept getting overpowered and thrown off the balcony. It took me a while to figure out exactly what was going on here -- we have to respond in Rabbinical fashion, posing questions to Zelig, and when he does not answer with a question, we can get a punch in. The conversation here is interesting in its own right -- we learn that Zelig believes God supports him in his Mafia dealings and use of violence to increase his own wealth, and it's only after protracted questioning that Stone can corner Zelig and punch him out. I opted not to kill Zelig, leaving him unconscious as a present for the police, rescuing Rajshree and returning to B'nai Ben-Zion. The ten thousand dollars may not hold out forever, the Rabbi notes, but it solves some short-term issues, and the experience has reaffirmed Stone's faith in his role as a spiritual leader. The most interesting aspect of the story's conclusion is that Stone still stands by his policy against interfaith marriages -- he sees them as a dilution of the Jewish people, a threat to their very existence, and while he recognizes that Rajshree and Jack were well-matched, he still stands by his convictions. It's an interesting conundrum whenever morality and religious conviction conflict, and Gilbert makes an unusual and interesting character choice here. 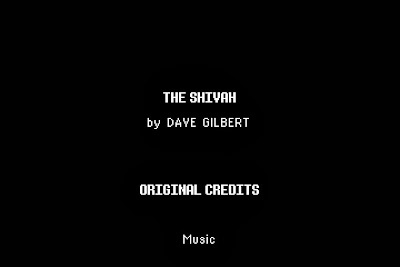 The Shivah didn't take a long time to play through -- the mystery is fairly straightforward as long as one examines all the available evidence, and there aren't a lot of locations or conversations to deal with. But it's an unusual specimen of the point-and-click adventure game, with a richness to its morality, characterizations and storytelling that transcends the conventional gameplay. It's very much worth playing, especially if you're interested in experiencing the boundaries of the genre, and it's never looked better. 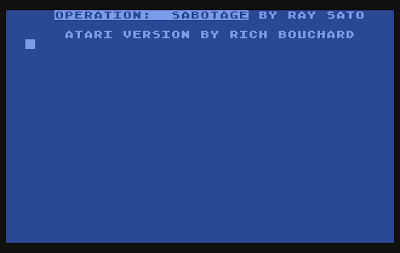 On deck this week is Operation: Sabotage, a 1982 text adventure by Ray Sato, ported by Rich Bouchard from the TRS-80 to the Atari 400/800 computers, and published by SoftSide Publications. It's very much in the style of the monthly adventures the company published in its disk-based magazine, though it doesn't seem to be part of that regular series. The game is written in BASIC, so the parser and display are a bit sluggish at normal speed, though that's easy enough to fix in the emulated modern world. Operation: Sabotage is a straightforward escape-the-alien-ship game, though we're on a mission with formal objectives which makes for a nice change. The parser is limited, with no EXAMINE or LOOK verbs and precious little READ information, and the puzzles are generally simple, though are there are plenty of red herrings scattered about. We begin in an airlock, with some PLASTIC EXPLOSIVE in inventory (INVENTORY or INV, the common shortcut I does not work) and nothing else visible in the room but a blue button and an exit south. It's probably a bad idea, but for the sake of investigation we can PUSH BLUE -- and yep, THE AIRLOCK OPENS... YOU ARE BLOWN OUT INTO THE VACUUM OF SPACE -- YOU ARE DEAD! So we're in space on a futuristic spy mission, not underwater invading somebody's island base. Good to know. South of the airlock room (after a restart) is a long narrow corridor spanning three rooms until we come to a SMALL ROOM, similarly nondescript. Further south we find a DECONTAMINATION CHAMBER with another blue button. Pushing it produces an orange glow that covers us and then fades away -- no obvious harm done, but no obvious reason to do so, either. Heading south again, we find a small storage chamber and a classic adventurer's implement in the form of a CROWBAR. West of this location is a larger chamber with a locked cabinet and passages continuing west and south. There's no EXAMINE or LOOK verb, and READ and USE don't often come into play, so we have to take most of these things at face value. Fortunately, the authors give us a generous eight-item inventory limit and no real juggling will be required once we know which items we can safely ignore. At the western end of this part of the ship (no port or starboard here!) we find an office with a large desk, and if we OPEN DESK we find something called an ELECTRONIC CONTROL BATON. We can't WAVE BATON or RAISE BATON, though. South of the office is another storage room, with some BATTERIES, always useful in these situations. Continuing south through another nondescript large hall, we find ourselves in an ENTERTAINMENT ROOM, with a screen and two buttons, red and blue. If we PUSH BLUE, the screen lights up and a movie is played -- but we can't WATCH MOVIE or LOOK SCREEN, so no further detail is available. We can PUSH RED to turn it off, but so far this isn't providing us with anything useful. Continuing south (the map is large but fairly schematic, so I'm trying to explore the length of it before heading back to the east) we find a DATA RECORD STORAGE ROOM with a COMPUTER DESTRUCT PROGRAM -- and if we try to READ PROGRAM, we learn that ONLY A COMPUTER CAN READ A PROGRAM, so at least it's not a type-in listing. Good thing we found this, as it seems we're poorly equipped for our sabotage mission otherwise. East is another empty storage room, so we'll head north from the office into a room with a card table in the center. We can't discover anything on or about the card table; to the east is a BIOLOGICAL LABORATORY with a red button on the wall. Pushing the button releases an ALIEN MONSTER, and we get into a combat situation. I couldn't KILL MONSTER or SWING BATON or HIT MONSTER -- and after three or four hits from the creature, we're dead. So it's probably best to restore and come back after we've found some sort of weapon -- probably a firearm of some kind, as the only command I found that gave a meaningful response was SHOOT MONSTER. Seeking further north again, we find a small, empty office, and a SMALL ELECTRONIC LABORATORY containing a SMALL BLACK DEVICE. It doesn't count as a weapon, though. North is a small chamber with a CALENDAR -- the parser will let us READ it, but reports I SEE NOTHING SPECIAL. There's also a STRANGE PURPLE ROOM in this area, with a blue button. This seems to be a teleporter between floors of the ship, as when we PUSH BLUE we're temporarily blinded by a flash of light, arriving in a similar room with a red button, but the surroundings have changed. From this location, we can explore quite a few additional rooms -- an empty library, a launch control room with a GALACTIC CHART that again yields no interesting reading, and several security check areas manned by trigger-happy SECURITY PATROL ROBOTs, trapping us and eventually killing us if we have no way to disable them. There's a WEAPONS STORAGE ROOM, but all it contains is a LARGE PHOTON BOMB, so that's probably not a good self-defense play. There's also a MEDICAL STATION with a SILVER PILL that might be needed if we take too many hits but survive. Aha! There's a ROBOT CONTROL CENTER in the northern part of this area; there's another attacking robot on guard, but we can see the CONTROL COMPUTER MOUNTED IN THE WALL. We can't INSERT PROGRAM or READ PROGRAM, or TURN OFF COMPUTER, though, so that's not helping yet. And now it seems we've mapped out the accessible parts of the ship, so let's get to work on the puzzles. We can't UNLOCK the locked CABINET, but we can OPEN CABINET using the crowbar and acquire a LASER PISTOL, which should help with the alien creature... except THE LASER SHOT HAS NO EFFECT. We can't set it for kill versus stun or anything. Hmmmm. Ahhhh -- I was trying to SHOOT ALIEN and the parser insists that we need to SHOOT MONSTER, otherwise it's interpreted as if we are firing randomly into the air. Several hits later, I manage to kill it without dying myself. We don't seem to gain anything from this, though, so maybe we should just leave the poor creature alone. Can we SHOOT ROBOT? Yes... but they're pretty well-armored, and it's a lot more direct and effective to SHOOT COMPUTER in the robot control room and shut down all the security droids. Past the robot control room, we can visit RADAR CONTROL and see nothing of interest on the radar screen when we READ it, so it appears this is more window dressing. The other droids are indeed shut down, so we can check out another empty security room, and a chamber adjacent to the ship's nuclear reactor, with a firmly locked door, where the small black device flashes brightly. We can access the REACTOR CONTROL CENTER through a small storage room south of the teleport room, where simple red and blue buttons turn the reactor on and off. We can also find some NITROGLYCERIN in the chemical lab, and a COMPUTER CENTER with a slot where we can INSERT the destruct PROGRAM, setting the base to destruct in 34 minutes, counting down at the rate of 1 minute per turn. We don't want this to happen yet, I don't think, as we haven't found a clear way off the base. The small black device is no longer flashing now that we've turned off the nuclear reactions (I don't think this is quite how these things work in reality), so let's see if we can enter the reactor. We can unlock its door with the security key we found earlier, but then THE REACTOR BUILDING IS NOT PRESSURIZED. YOU ARE BLOWN INTO THE VACUUM! So that wasn't a good idea. Where else can we go now that we're free to roam? There's a RADIO ROOM with a portable radio we can't LISTEN to, and a small room with A SAFE IN THE SOUTH WALL that seems to require a particular key if we try to OPEN it. Ah, and an office with a button controlling PRESSURE TO REACTOR, according to the handy sign (which is written in English!) Now we can enter the pressurized area, with the reactor shut down, and see the nuclear reactor with a computer on the wall. 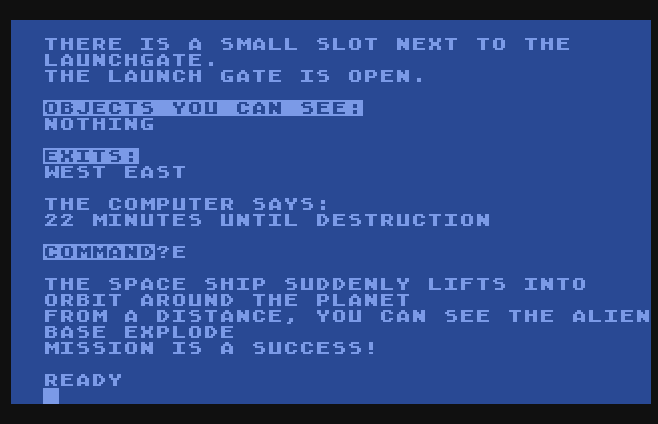 READ COMPUTER produces no interesting information, per usual on this tight-lipped ship, and we can SHOOT COMPUTER to... blow up THE WHOLE NUMCLEAR [sic] REACTOR and die, of course. There doesn't seem to be any reason to come in here, actually, which seems odd as there's so much puzzle-like material surrounding it. What else? There's a SMALL LAUNCH AREA in the northeast corner of the ship that has a small slot and a closed launch gate. Maybe this is where we need to come to make an escape after setting the ship to blow up? Ah, there's a LAUNCH SYSTEM CASSETTE in the desk at Launch Control. Futuristic science-fiction setting, 1980s technology! So do we need to do anything more, beyond setting the computer to destruct and launching ourselves out of here? INSERTing the CASSETTE opens the launch gate... and heading E into the gate lets us escape with no further action required, but of course, YOU DIDN'T DESTROY THE BASE. YOU HAVE FAILED YOUR MISSION. So we need to backtrack a little bit; this last part is straightforward... and this time, we escape with 20-odd minutes to spare... and the base is destroyed... but YOU DIDN'T RECOVER THE SECRET PLANS NEEDED BY STAR COMMAND. Okay, okay, we're pretty close; most likely the secret plans are in the safe. Maybe that's why we brought the plastic explosive along... but we can't STICK or PLANT or INSERT EXPLOSIVE, or BLOW SAFE. SHOOT EXPLOSIVE doesn't do it, either. Can we use the radio to set up a remote trigger? No, if we try to USE RADIO we just learn that it's silent, and the batteries are not useful for bringing it to life. Interestingly, START RADIO is interpreted as a STATUS command printing out the player's current hit points, dexterity and luck attributes, though these don't seem to be very fleshed out as factors in the gameplay. Hmmmm. Can we use the nitroglycerin to blow the safe? No go on that front either. So it's time to peek at the source code -- and discover that, in a rare design choice for this era, all of the in-game text is encrypted in the listing! We didn't have to do any decoding in-game, but to cheat we need to do a little work. Fortunately, it's a simple alphabet-reversal cipher, with A=Z and Z=A. So SAFE would be HZUV... and there's a phrase GSV HZUV RH ZOIVZWB LKVM, or THE SAFE IS ALREADY OPEN... which is no help. R WLM'G SZEV GSV PVB GL LKVM GSV HZUV -- that's just the "no key" message we get when trying to open it normally. GSV HZUV LKVMH -- THE SAFE OPENS is more promising; what triggers this? It happens on line 2120 -- when V2=7 and A=26 (we're in the safe room) and D9=N0 (the safe is not already open). What does V2=7 represent? Oh, wait, are we supposed to USE BATON to open the safe? It's the seventh item on the list of objects, so V2=7 might reference it. And yes! So that's what it controls! And the safe contains the SECRET PLANS, as expected. We grab the plans, start the destruct program, go to the launch gate, and this time, victory is ours with 22 moves to spare! Operation: Sabotage is a pretty straightforward adventure -- while there are lots of red herrings to distract us, most of the potential puzzles that the designer seemed to have had in mind aren't fully realized, so it's mostly a matter of opening all the desks and making appropriate use of the "secret" items found therein. Ray Sato worked on a few other SoftSide adventures, so we'll probably run into his name again. 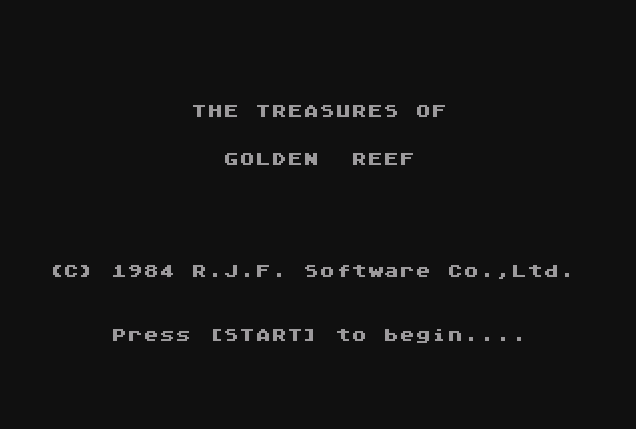 This week, we're tackling an Atari 400/800 text adventure, The Treasures of Golden Reef, published in 1985 by the magazine-on-tape Atari Computing. These magazines were fertile ground for now-obscure text adventures, as these games could be developed by a single designer/programmer on monthly deadlines; this one was written by Robert J. Fry, and credited to his company R.J.F. 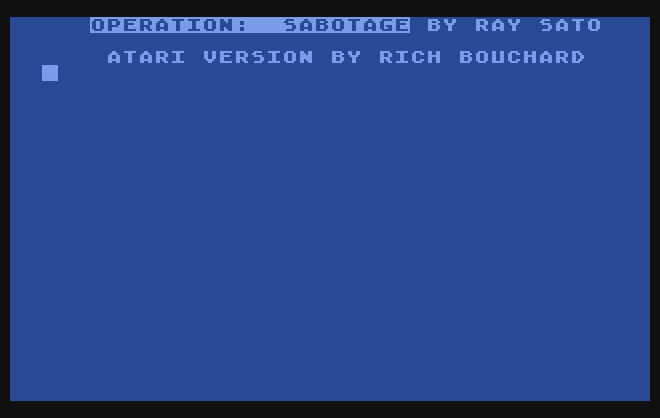 Software Co., Ltd. circa 1984 on the title screen. 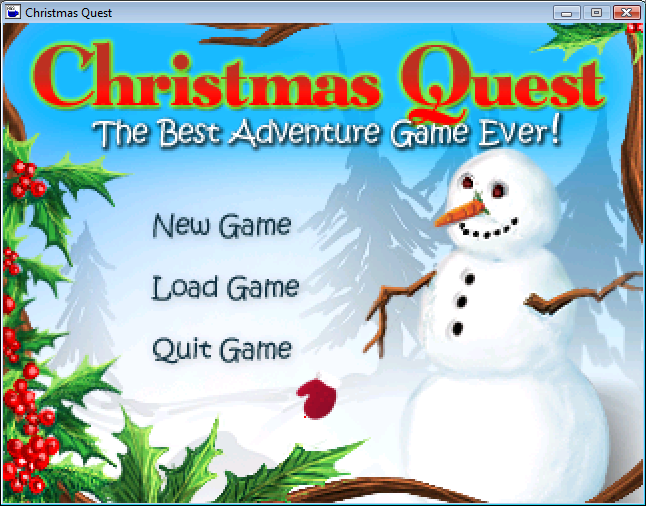 It's a fairly conventional treasure hunt game that doesn't take too long to play through despite a few gameplay glitches, and its design and phrasing are clearly influenced by Scott Adams' seminal microcomputer adventure games. 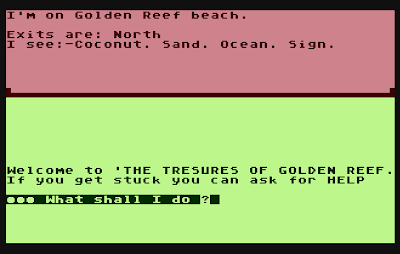 We start out on Golden Reef beach, where a typo in the intro text may not bode well for this adventure's quality. The traditional READ SIGN yields the familiar "DROP *TREASURES* HERE." 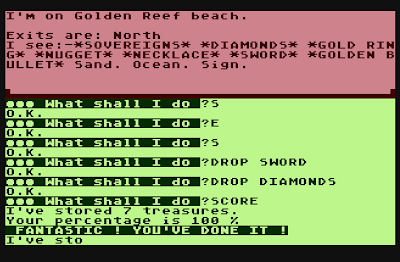 While it's not formally mentioned, there is also the traditional SCORE command, reporting percentage of treasures claimed, and we will need to use it in order to finish the game. On the beach, we see a coconut and some sand and ocean. We can GET COCONUT but not OPEN COCONUT, and we have nothing we can DIG with, until we LOOK SAND and find a shovel. There's still nothing to dig up right here, though. Heading north up the beach, we find ourselves in another vaguely familiar adventure setting, a field containing a hut with a thatched roof. There doesn't appear to be anything inside the hut, even if we dig. There's a passage to the west, and a path that (as it turns out) travels eastward. We can GO PATH to discover a shallow lake and a long plank; we can GO LAKE and dig to find a rusty key (and we must GET RUSTY KEY, not just GET KEY, so there may be additional keys in our future.) It's too shallow to SWIM here, but we can travel further east to emerge on a grassy plain. Oddly, there's a cactus growing on the plain; we can't see anything special about it, and a clearing to the north of the plain doesn't seem to contain anything of interest either. Can we TELL JOKE to the cow? No, the parser doesn't get that, but we can READ JOKE -- all we get is a private "Ho Ho !" in response, though. We can OPEN BOOK a second time to produce a note -- it says, "Talking to cows can give you a MOOving experience." But we can't TALK COW -- the verb isn't recognized -- or MOO, or SAY MOO, apparently. We can't CLIMB the very tall WALL -- it's too tall and steep -- and DROP PLANK doesn't help us scale the height. Aha! We can GO COW to reach Daisy's back, and then SAY MOO to travel -- though not in the way I expected, as she bucks us off and -- with an Adams-esque suddenly I'm elsewhere -- we find ourselves on a hilltop, above the very tall wall. North of the western base of the hill, we find a cave... with a locked door... for which the rusty key isn't useful. South of the hill is a ditch containing a *NECKLACE*. 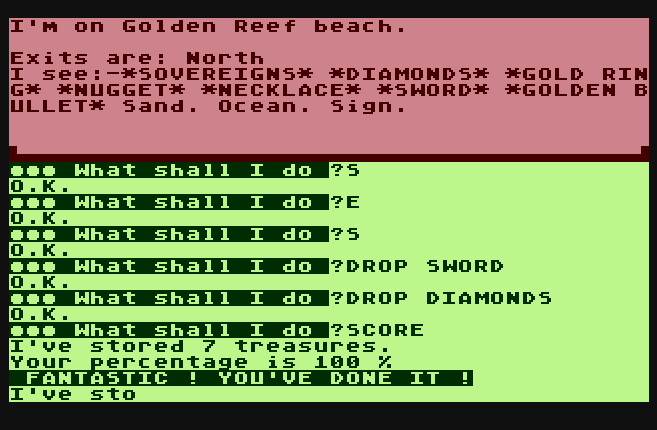 The one treasure, returned to the beach, gets our SCORE to 16%, so we must have six treasures to find. So what other puzzles do we have to solve? We can try to GO OCEAN from the beach, but Glug Glug. I drown. We can GO ROOF at the hut, and EXAMINE ROOF to find a small key, which allows us to unlock the cave door. Entering the cave, we find ourselves in a north-south passage, and it doesn't look like we're going to need a light source in this game. We can enter a maze of caves but it's not really a maze, we can map it out without having to deal with any twisty passages or other confusing navigation. There are a number of items in the cave, and with a little exploration we can acquire a fur, and a spear. There's another exit from the cave, in a room with a crack in rock. We can GO CRACK -- it must be a fairly broad crack, as inventory encumbrances don't seem to come into play at all -- to access an eastbound trail. Heading east, we can pick up some rope and see -- if not CLIMB? -- a tree before we reach the base of a mountain. GO MOUNTAIN takes us to its summit, with a rope bridge. Before crossing it, let's go back to the tree -- we can't CLIMB TREE or GO TREE (TREE isn't recognized) but we can go U to see a hole in the tree. It's a pretty big hole -- we can't LOOK HOLE to any notable effect but we can GO HOLE to find another locked door, which can be unlocked with the rusty key to access a secret passage -- but there doesn't seem to be anything in it? The rope bridge is more stable than I thought it might be -- we can simply cross it to reach a rocky hill. Climbing down the hill, we find ourselves near a mountain -- and a bear! We can try to THROW SPEAR, but it doesn't do anything but land on the ground, and now we can't pick it up as the bear won't let us. KILL BEAR has the same effect, though, so while the spear is an appropriate weapon maybe that's not the right approach. We can try to TIE ROPE -- To what? -- but TO SPEAR doesn't seem to work, so we have no opportunity to retrieve the spear for another try that way. We seem to be wearing the fur we picked up, as WEAR FUR yields only I ALREADY HAVE IT, but I never confirmed any practical reason we need to carry it. Can we open the cactus somehow? The spear, the coconut and various attempts to BREAK it don't seem to work. The coconut has a cross marked on it? We can SHAKE COCONUT and something rattles inside. Dropping it from the tree doesn't seem to open it up, either. So there's quite a bit of map here, and we've explored most of it, I think, but the puzzles aren't making themselves apparent... though I was playing this late at night and the combination of compass directions and GO commands led me to miss some available navigation in my mental model of the game's world. I hadn't been east of the grassy plain, for example, where we find a rocky cliff with Another cliff opposite. We can DROP PLANK to make a bridge, and cross it to reach a tall cliff on the other side. North of the canyon is a valley with an arch bridge and a small stream underneath. There's a fish in the stream, if we go there and examine it, and we can GO BRIDGE to encounter a crocodile; we just have to THROW FISH to send it on its way, and then we can find a *SWORD* on the river bank north of the bridge. With the nugget and sword scored, we have 44% -- so there must be seven treasures, not six. With the sword, we can KILL BEAR and go east from that point to reach a pasture, where can we dig up some *SOVEREIGNS*. Four treasures down! And the sword has more uses -- we can now BREAK COCONUT to find a *GOLDEN BULLET* (or was that possible because of the stone?) So that's five. What about the seemingly empty secret passage? Ah, more bad mapping on my part -- I was confusing the exit upward with the door inside the tree -- with that door unlocked, we can access more of the secret passage to reach a pit with a huge rock. We can't seem to DIG ROCK or PUSH ROCK or EXAMINE ROCK to any purpose, but we can MOVE ROCK to discover a *GOLD RING*. Just one more treasure to go! Tracking the last one down was a matter of brute force and thoroughness -- I had missed a viable DIG spot, just inside the maze of caves, where we find some *DIAMONDS*. And now we have them all -- and I have to be quick on the draw to capture a useful screenshot, as the victory message starts printing repeatedly, infinitely looping until we turn off the computer! 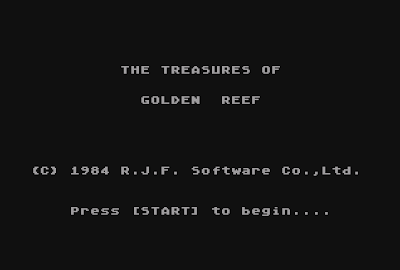 The Treasures of Golden Reef is nothing special or unique, but it's a very typical example of the late-1970s/early-1980s style, despite not being published until 1985. There's no story to speak of, and no character interaction or deep mythology. But it was a pleasant little excursion, and I kind of wish Mr. Fry had published that second adventure promised by the leaflet.